This is where our journey begins. 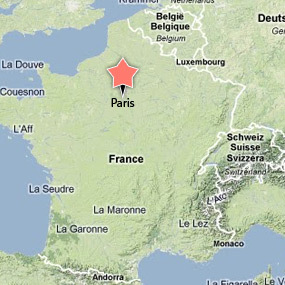 We arrived in Paris feeling anxious and excited to see what this city, and Rick, had in store for us. We were a few days ahead of our tour date, so we brushed up on our French, found our hotel on a map, and hit the town on our own. We were able to track down the Eiffel Tower, Siene River, Champs Elysse, Arc De Triumph and so much more, and that was only the first day! 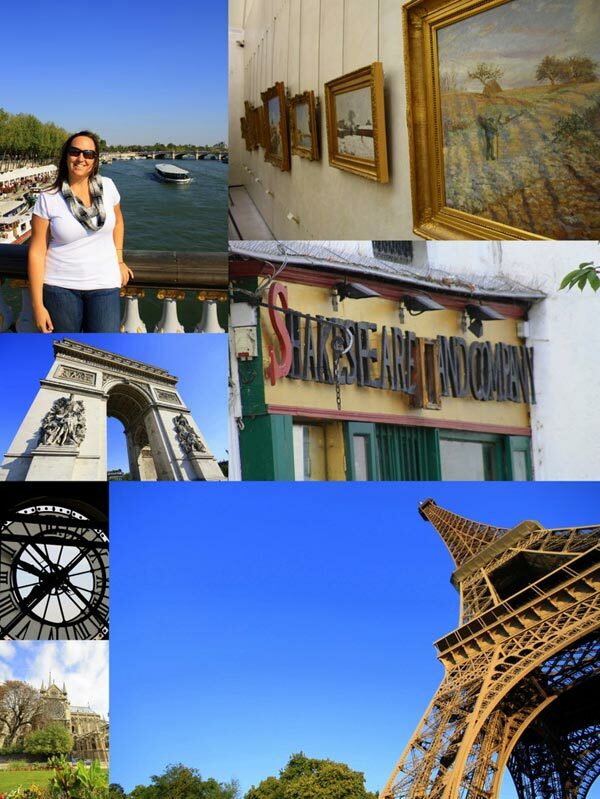 Below: Nicole overlooking the river Siene, artwork at the Musee d’Orsay, the Arc de Triomphe, Shakespeare & Company bookstore, clock at the Musee d’Orsay, Notre Dame and the Eiffel Tower. It was easy getting into “tour mode” with our newfound friends. Coleen, our fearless leader (and professional speed-walker) gave us a crash course on how to navigate the city, and away we went. 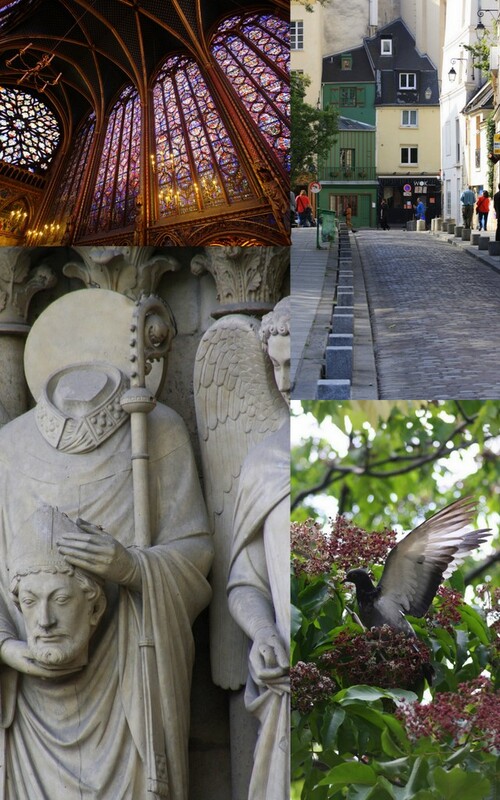 We spent the day exploring churches, city streets, cafes and all that Paris had to offer. Being with Colleen was turning out to be a definite perk. Unlike some of the other (embarrassing) tour guides, Colleen felt more like a trusted friend. She knew all of the best ways to see the sites, get around town, and get the best bites. 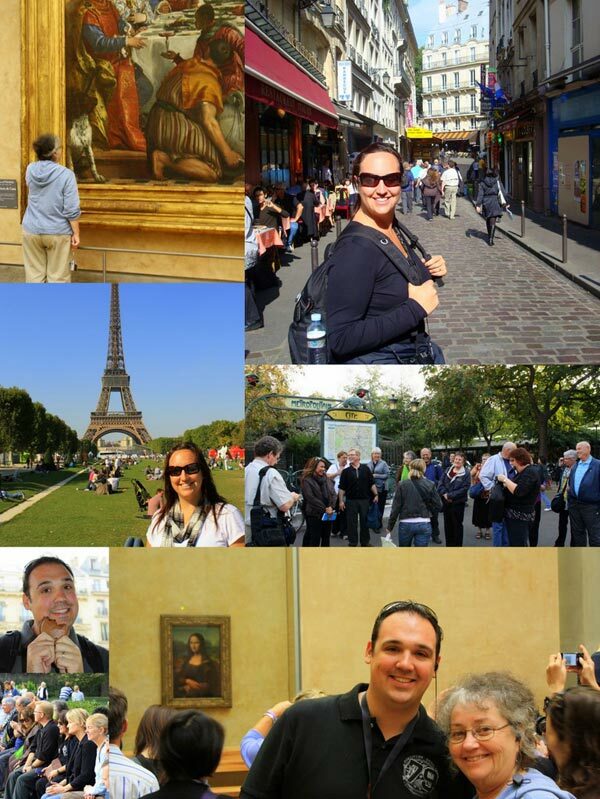 Below: Jeanne at the Louvre, Nicole walking the Spanish Quarter, Nicole at the Eiffel Tower, the group at a metro stop, Kevin with the life-changing macaroon, the group learning about Notre Dame and Kevin & Jeanne finally meeting Mona Lisa. This really is the city of lights. 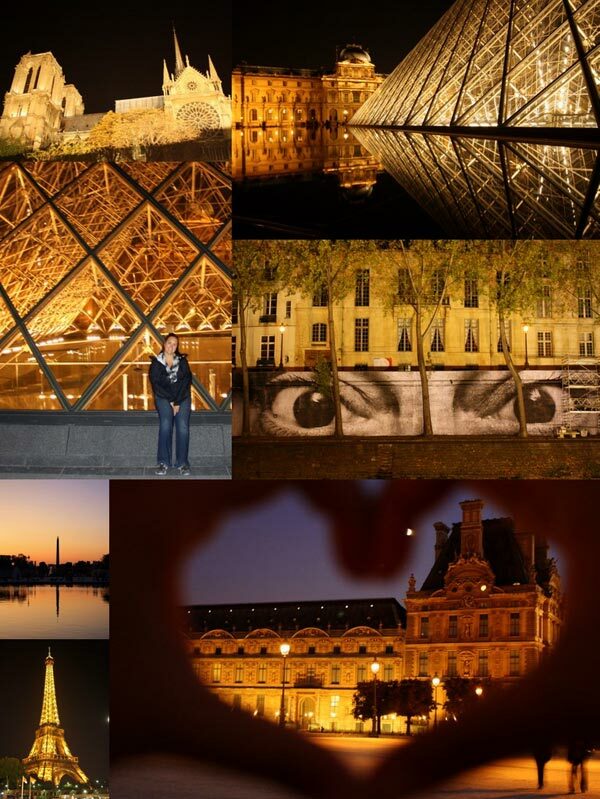 Between strolling around on our own and cruising the river Siene with our group we were surprised to see that Paris is even more breathtaking at night. 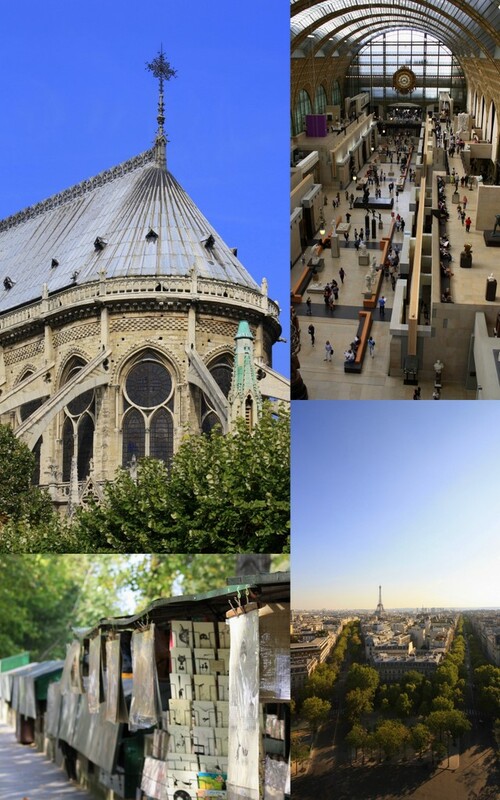 Below: Notre Dame, The Pyramid at the Louvre, an “eye-catching” painting along the river-walk, Cleo Patra’s Needle, the Eiffel Tower and the Louvre. 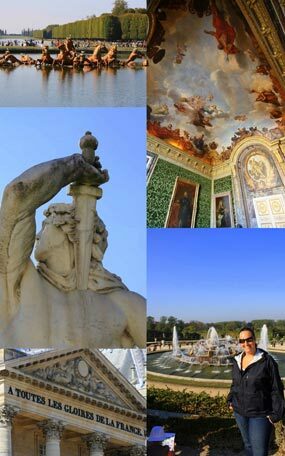 Before “going on tour” we ventured out to the palace of Versailles solo. We had heard that it was big and beautiful, but that is the understatement of the century! After walking for literally miles upon miles we have a new appreciation for Versailles. 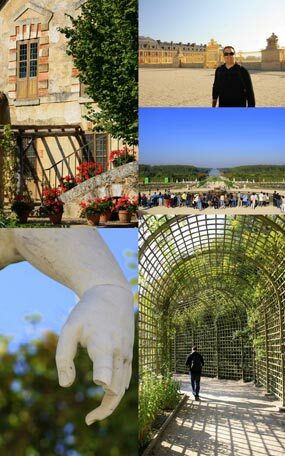 If you are in Paris, this place is a must-see! These are a few of our favorite shots from Versailles. 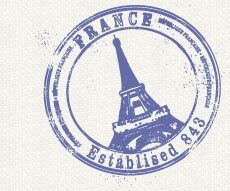 Paris, How Do I Love Thee? Some of the best times we had in Paris (when we weren’t eating) were simply wandering around the city. These are a few of our favorite photos. 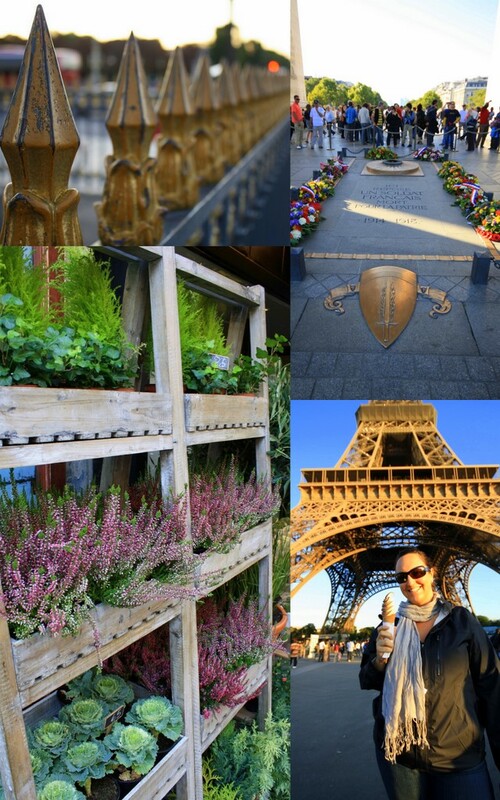 Above: The fence around Cleopatra’s Needle, eternal flame under the Arc de Triomphe, plants for sale on the Rue Cler, enjoying a gelato under the Eiffel Tower. Above: The stained glass in St. Chapelle, Rue Saint-Julien le Pauvre, headless saint at Notre Dame, pigeon in tree near Notre Dame. Above: Notre Dame, Musee d’Orsay, bouquinistes along the river Seine, view of Paris from the top of the Arc de Triomphe.